Like Fender, Gibson are more known for their electric guitars – particularly the Les Paul – but there is also a wide selection of Gibson acoustic guitars. Unlike Fender, Gibson’s acoustics are focused on the higher end of the market – whereas most of Fender’s acoustics are at the more affordable end. Below are details on the Gibson J Series of acoustic guitars currently being produced as 2016 models- starting from the lower cost guitars and working up. With the lowest priced Gibson Acoustic (The J-15) being $1,499 (USD) – not including the Maestro by Gibson acoustics and assuming you count Epiphone as a different brand – you can see why I say that Gibson are targeting the higher end of the market. This is in stark contrast to Fender’s acoustic strategy – their highest priced acoustic is $999.99 (USD) and you can get Fender acoustics for as low as $120. All of Gibson’s acoustic guitar’s featured in this post are handmade and the J-15 is no exception. The J-29 is similar to the J-35 except that it has solid rosewood back and sides. Otherwise it has the same features as the J-35 does in the list above. Now we get into the J-45s, starting with the Standard. J-45 is Gibson’s best-selling model. So what’s the difference between the J-35 and J-45 apart from the finish and the tuners? Firstly the J-45’s neck profile is slimmer but most importantly it’s the bracing. The J-45 has Gibson’s standard X bracing pattern and the J-35 has the advanced jumbo X bracing pattern. So, what does this mean? Check out the video below to learn more. Personally I find the J-45 richer/fuller sounding and prefer that – but this is a personal preference thing – and others prefer the J-35. Which do you prefer? The Custom J-45 features Rosewood back and sides – this is the major difference between the Standard and the Custom. There are some other small differences but that’s the major one. There are some other smaller differences too. The big difference between this and the Standard is the Solid Mahogany Top in place of the Sitka Spruce top. The Progressive is very like the Standard in most ways – but there are a couple of major differences. The progressive has a Richlite bridge with a titanium saddle. This is different but not the biggest difference about the bridge – the biggest difference is that it’s adjustable. It’s called a tune-o-matic bridge and allows you to easily adjust the action (string height). Another limited edition produced for 2016 is the 1950’s Antiquity edition. The next limited edition option is the 1968 Ebony model. The last of the limited edition J-45s is the J-45 Vintage. The Vintage is new for 2016. Finally we have the most different guitar in the J Series lineup – the J-185. It is a Jumbo shaped guitar and features premium tone woods to go with the premium pricing. Moving on from the $1,499 priced J-15, the J-185 comes in at $3,999 to round out the J series. There are plenty of options in Gibson’s J Series acoustic guitars. And there’s plenty of difference price-wise too. But they are all quality hand-made instruments made with quality woods and materials. 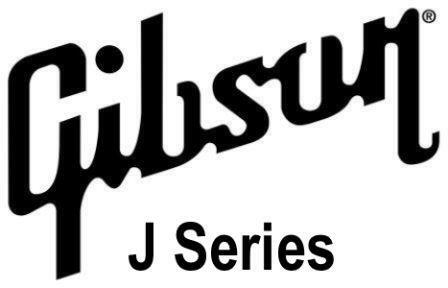 If you’re looking for something more affordable, then Gibson’s acoustics are probably out of your range, but if you’re looking for a premium model, then the J series guitars are worth checking out. Hi Nathan. There sure are a lot of different acoustics aren’t there. I really like the J45 Red Spruce model, with the light colored wood. I just think it looks a bit different, and unique. I like the sound of acoustic guitars. When I was a teenager, a whole lifetime ago, I learned how to play on an acoustic, but then of course I had to have an electric. A teenager in the sixties, come on! but I really do like the softer sound of an acoustic. I guess that’s reflective of my change in musical taste as I’ve gotten older. I like music in general, a lot, and an acoustic guitar has such a mellow sound. thanks Nathan for the nice website and the good info about the guitars. Thanks for visiting. Yeah the Red Spruce model looks nice. It’s got a bit of a different sound to the other models too because of the Adirondack Spruce top. Would be nice to know that there are so few others out there too. It’s never too late to start playing again! You might not be able to afford a Gibson J Series guitar but there are other great guitars for a cheaper price. Check out the “Guitar Reviews” menu at the top where you can search for guitar reviews by price – of course these are only a selection of the many guitars available but it’s a good place to start.